The benefits of slow change. When I was younger, whenever I wanted to make any change in my life I always made big plans and took big leaps. More often than not, I would fail in my attempts to make any significant changes in how I lived. Often I would end up back where I started... only more frustrated and less likely to try again. I tried fad diets, started exercise regimes which never lasted and tried to give up bad habits cold turkey. Every time I failed, I ended up creating a cycle of disappointment in myself and even more reasons to not bother making any changes in my life. For me, preventing bladder infections has meant I had to make some pretty big changes to my diet and lifestyle. If I wanted to avoid ever getting them again I needed to make these changes for good. So I tried something new. I tried doing it slow. 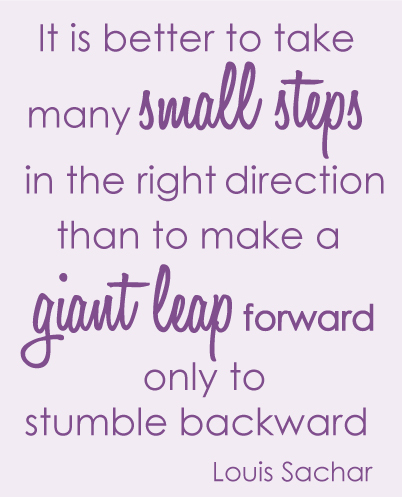 To me slow change is about making small incremental steps instead of big leaps forward. Often you don't plan the entire journey but rather do what naturally comes next, as and when it becomes natural to do so. This has made such a change to the way I live, not only in preventing bladder infections, but in my overall health, happiness and well being. There are many benefits to slow change. Rather than using will power and grit, determined to get the mythical end goal of "health", I have begun to enjoy the journey for what it is. I get to feel the magic of discovery each time I find a new healthy food that I like. I have tapped into something I already know I enjoy – learning, and have made it work for me by learning about things that contribute to my health. I love being able to connect with other people, so being able to join groups where people discuss their healthy choices is inspiring and fun. I also get to enjoy the changes that my body begins to make as I start to make incremental differences to the way I treat it. I can see the reaction to foods and exercise and appreciate that I am doing something that it is going to pay dividends for the rest of my life. Rather than focusing on where I will end up, I am loving this stage of discovery and the feeling of moving forwards not matter how slow it may seem to someone on the outside. One of the reasons some of my big leaps didn't work in the past is because they weren't right for me. But I can be pretty stubborn sometimes and after investing all the energy, time and effort in getting there, I didn't want to admit it to myself. I would try to stick to a change that ultimately wasn't even the best thing for me and eventually fail, making me feel guilty. The beauty of slow change is that you get to discover as you go if something is for you as you go and make adjustments as you progress. Preventing bladder infections through what we eat is a such a good example of this. There is so much information out there about what is the "right" way to eat. Often the advice can be conflicting. One person will say "this is the best way" and then another person will say that something completely different is the only way. Every person is different, it would make sense that what our bodies need will be different too. 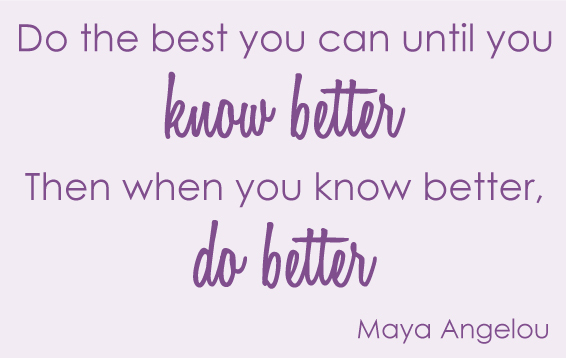 The only way to know for sure is to test and compare for yourself. This may take a little longer but the rewards of having something that is ideal for your body is cannot be overestimated. One of the biggest things that used to hold me back from making changes in my life was fear of failure or guilt when I inevitably did "fail". Failure is a great way to learn and to practice for the next attempt but often holds people back from starting again. Guilt from not doing what you think you should be, holds you back from trying new things and from experimenting. And guilt makes you feel bad. Slow change means no guilt. You are changing as fast or slowly as you feel comfortable. If you have a bit of junk food, it's no reason to feel guilty, to write the day off, or to try and punish yourself. It is what it is and you are able to eat what you want. There is no need to feel guilty. The changes I have introduced slowly, may have taken a lot longer to add into my life than if I had taken a big leap but fortunately they seem to stick around a lot longer too. Slow change is about practice and that repetition creates habits. Habits can stick for a lifetime if you want them to. It becomes easy to forget that there ever was a time where things were any different. The way that you eat or exercise or meditate or any other thing you are doing in your quest for your health, becomes so natural that you never even think of it as a struggle to keep doing it. Preventing bladder infections through slow change, means that to someone on the outside it may appear that I haven't really made many changes at all. But to me it has made all the difference. My health overall is better and I no longer get painful bladder infections. But possibly the biggest change has been in my happiness. I have fun making these changes, I have discovered new passions in my life and I no longer need to feel guilty. What techniques have you used to create lasting positive change in your life? The tips and tricks you share can help others to learn, wherever you are in your journey.